Canton, Ohio is the birthplace of professional football. It is also the largest city in the county, is known across the country as the home of the Pro Football Hall of Fame. The Hall of Fame is a five building complex where football greats are featured, and has been visited by more than 10 million people since its opening in 1963. The Hall of Fame festival captivates the county each August, and is a week–long celebration that features a food festival, a balloon classic, the enshrinee induction ceremonies, a celebration concert and a football game. Canton is committed to the preservation and restoration of its historic buildings, including the Saxton House, National First Ladies Library and the Stark County Courthouse. 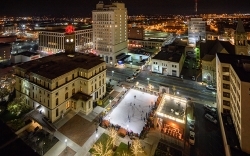 The city boasts a cultural complex which features the Canton Ballet, the Canton Museum of Art, the Player's Guild theater troupe, and the Canton Civic Opera. The Canton Symphony Orchestra is situated on the McKinley High School campus. Another featured attraction of the city is the William McKinley Presidential Library and Museum and the Memorial where President William McKinley's body is entombed. Shopping facilities and restaurants are plentiful. More information about Canton may be found at Canton Regional Chamber of Commerce or Visit Canton. Canton is also the World Headquarters for The Timken Company and Timken Steel.